1-2 February, Tebangetua, Maiana – A ten-member WASH (Water, Sanitation and Hygiene) team, led by UNICEF’s Chief Field Officer, Cromwell Bacareza, visited Maiana, on a speed boat, to conduct a survey at schools on the island to determine their WASH compliance and resilience and also to monitor the progress of EU-funded Rain Water Harvesting tanks for communities. The team was welcomed by the Mayor of Maiana, Rakunoua Tiota, at the Council guesthouse, where he was then briefed on the purpose of the team’s visit. The Mayor then asked the UNICEF Chief to assist with his Council’s Strategic Plan for Children for 2017-2020. The team later conducted surveys at Urintebura and Tebouria Primary schools and at the Maiana JSS. On the following day, the team left Tebangetua to Tebikerai where a similar survey was conducted for Nei Karevea Primary. The survey collects information on WASH topics such as the source, quality and quantity of water at the schools, availability of toilets and hand washing facilities, tooth brushing practices and even school management and governance structures. The use of Internet technology to locate the schools using a GPS devise installed in the tablets, as well as the fully digitalized response recording, allowed for immediate analysis of the survey reports. The team also brought water containers, toothpastes and pastes, soap and other items for pupils of the schools visited to improve WASH practices. All schools visited on Maiana have high WASH competence as seen from existing toilets, tippy taps and gardens. 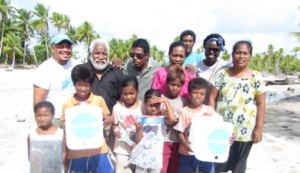 Members of the team included UNICEF’s staff including one from Fiji, staff from the ministries of Education, Health and Medical Services, MP Kaure Baabo and the Executive Officer of KiLGA and others. School children at Nei Karevea Primary, Tebikerai, Maiana, posing with MP Kaure Baabo (with bead) and UNICEF’s officers including Mr. Cromwell Bacareza (with cap).